A few days ago I received an interesting request from a reader (PP) the answer to which could comprise a book. Gary North recently posted an article [June 24, 2009] critiquing Mish's views of deflation in which he posted and commented on John Exter and his pyramid. That is the only time I've seen that pyramid outside of your website. North previously criticized the "Pushing on a String" perspective in the below article [June 20, 2009 and for our discussions I add a December 27, 2001 article] ...which was directly addressed [June 22, 2009] by Mish. Given your use of the pyramid and familiarity with Mish, I would welcome your thoughts on these issues -- especially in the form of a blog post. I am sorry for the loquaciousness of this response but I think it will adequately address a few of the material issues; some not picked up by The Automatic Earth. The attempt to read, digest, analyze, synthesize, hone in on the key issues, distinguish and contrast these two prolific and intelligent writers has proven a formidable task and this response is fairly brief for the book it could be. The main issue is inflation or deflation; whatever those are. Even worse is the intellectual dead end they lead to. "Roast me! Hang me! Do whatever you please," said Brer Rabbit. "Only please, Brer Fox, please don't throw me into the briar patch." tions deeply rooted in ideas and arguments. While I occasionally name those whose ideas I attack, like Mr. Mankiw and Mr. Krugman with their 0% interest rate lunacy, I try to keep the focus on logic, reason and explanation. In 2001 he raises a great issue. "Economists are part-time verbal magicians, kind of like Harry Potter, except that they don't have any power. ... This raises the question of what constitutes money." Then he quotes Greenspan testifying about the problems with defining what money is. In 2009 he brings up John Exter and not in a favorable light. His argument remains the central pillar of the deflationist camp – a tiny band of intrepid non-economists who have seen their founder's prediction refuted by the facts in every year since 1973. But economic events since mid-2008 seem to indicate that Exter may have been right, they insist. ... At any time, the FED can get all of the banks' money lent. But the FED knows that this will double the money supply within weeks. This will create mass price inflation. This is the central fact in the inflation vs. deflation debate. Until the deflationists answer it with a unified voice, they will remain, as their predecessors remained, people with neither a theoretical nor a practical case for their position. Since when did things that have not yet happened become 'central facts'? Anyway, the article directed to Mish is primarily about inflation, deflation and gold and contains an earlier version of the pyramid. In times of deflation, gold's price will fall. ... The only argument against a falling gold price in a time of general price deflation is John Exter's: "pushing on a string." He says there will be a rush for gold as the most liquid asset. Here is his pyramid of solvency. ... It was an untested theory in 1973. It remains untested. Notice that Exter put currency just above gold. This theory is logical. Mr. North does a good job of synthesizing Michael 'Mish' Shedlock's assertions. 1. The debt pyramid will implode. 2. The Federal Reserve will not be able to stop this. 3. There will be serious, bankrupting, depression-creating monetary deflation. 4. There will be long-term price deflation." Of those watching money supply, some concentrate on Base Money supply as Gary North does, others M2, M3, MZM, or even Austrian Money Supply as a measure of inflation. Interestingly, there are even two different versions of Austrian Money supply with a pretty big difference between the two versions. We have a credit based economy and anyone watching money supply and not watching credit is simply wrong. This is a statement of fact, not idle conjecture. Only those watching and expecting the collapse in credit and understanding the role of gold got things correct. This is a very small group of people. Mish has also tacked the definitional quagmire with his post Inflation What The Heck Is It. In his post Nonsense About Gold Backwardation, Ameros, Yuan Devaluations, etc. he stated "There is nothing special about backwardations. Period. OK they are rare in gold. So what?" I will address these definitional issues, the inflation versus deflation argument and the role of gold as money. I am a wordsmith; words are my domain. A reason why most individuals have such trouble with economics is that correct economics is rare! Most economists are employed by large government funded institutions. Still others work for large banks. There is a status quo and they are not to disrupt it. Let's face it: Most 'economists', like Mankiw or Krugman, are court economists. The stone-cold truth is it is in the financial best interest of most finance professionals, economists and other academics for you to remain clueless to basic economic law. There is a strong conflict of interest between you and them. On the bright side, I think neither Mish nor Dr. North are court economists. Mr. North correctly frames the issue, 'what constitutes money', but fails to proceed with any meaningful economic rule statements and consequently the analysis which flows is scattered and unfruitful. Mish asserts rule statements, some I agree with and some I do not, the analysis that flows is coherent, although some is faulty, but overall it is extremely pragmatic and practical. For example, in the first chapter of my book I address the inherent faultiness of Chartalism, the difference between a transaction being settled versus extinguished and assert an element of basic economic law that "Money must have intrinsic value by being a tangible asset." What flows from this underlying premise is the ability to distinguish between money, money substitutes and illusions; all of which can be currency. With that foundation in place then I march along through inflation and deflation. In this point, Mish is correct that the 'money supply' means all different things to all different people, even among the Austrian school. In the first chapter I assert "Rather than spill bottle after bottle of ink, I will provide a general roadmap for this area. I will tend to stick to the fundamental Austrian School of economics. They define inflation as an increase in the money [conflating money, money substitutes and illusions] supply and deflation as a decrease in the money supply." Notice how the distinguishing characteristics either broaden or narrow the currency or money supplies? With that foundation in place and still not out of chapter one I strike at the key issue. Physical law presents conflicts that require an either/or answer. For example, either the sun revolves around the earth or the earth revolves around the sun. Both cannot be correct. This same immutable law applies directly to determining which asset-the FRN$ or gold-is the risk-free allocation of capital. This is the single most important decision an investor can make. When the United States packs the emergency kits for Navy fighter pilots, it includes hundred-year-old quarter-ounce British Sovereigns. Why? Because at all times and in all circumstances, gold remains money. However, with the FRN$ as the world's reserve currency, most financial professionals assert the FRN$ is the risk-free asset. What do Mr. North and Mish consider the risk-free asset? In other words, how do they price things? Do they use the 'dollar'? What is a dollar? WHAT IS PRICE AND WHO CARES? Both Mr. North and Mish seem to price assets like houses, stocks, cars or food in FRN$. Mr. North may need to read The Golden Constant, which oddly is free of bias, to get his facts straight and because he is not a photographer but a serious economist I suppose he has plenty of free time to study select economic works. But the real issue, both theoretically and practically, is value not price. In The Golden Constant Professor Jastram examined 416 years of Anglo-American price data and established a statistical relationship using a price series construct for both gold and wholesale commodities. The conclusions on page 175 were very interesting. First, gold hedges major inflations poorly. Second, during major deflations gold increases in operational (ordinary daily transactions) wealth. Third, gold's ability to hedge yearly commodity price increases is ineffectual. Fourth, over long periods of time gold maintains its purchasing power and fascinatingly this is not because gold advances to commodity prices but because commodity prices gravitate toward gold. As Professor Jastram observed on page 130, "As we have said, the purchasing power of gold depends on the relation of commodity prices to gold prices. A close scrutiny of this relationship over time discloses an affinity of a curiously responsive character. It could be called the 'Retrieval Phenomenon', meaning that the commodity price level may move away higher or lower, but it tends to return repeatedly to the level of gold." Contango is supposed to exist because of gold’s inherently negative interest rate. The future price of gold is generally the spot price plus the future value based on the currency’s interest rate, minus cost of storage and a premium for counter-party risk. The question becomes: If I earn no interest on my dollars, euros, yen, etc. and lose purchasing power from inflation then I have a negative real rate of return. If I have a negative real rate of return then why should I own fiat currency instead of gold? This raises the issue of the central bank gold price suppression scheme which has been proven by Gold Anti-Trust Action Committee. As Harvard trained attorney Robert Landis asserts, "Any rational person who continues to dispute the existence of the rig after exposure to the evidence is either in denial or is complicit." Now backwardation in the monetary metals is like the canary in the coal mine. Sustained backwardation will signal the failure of the rig. This will not be a garden variety exchange rate adjustment like Argentina in 2001 or Weimar Germany but instead the collapse of a worldwide monetary system; the largest in history. But for now the Fear Index, discussed in Chapter 11 of John Rubino's The Collapse of the Dollar, is still extremely low relative to historical trends. It is like I am a lone three-eyed fish in the investment and financial commentary world. I assert that gold is not a portfolio asset but that everything else is. Oil is produced for fuel; wheat for food. Feet and yards are used to perform mental calculations of distance; grams and pounds are for mental calculations of weight. Gold is produced to perform mental calculations of value. In other words, as these three charts of over twenty in my book show; I price assets in gold and silver to evaluate their value. With these principles firmly in place I can give a cursory treatment of The Great Credit Contraction. First, I have updated and adapted with estimations the liquidity pyramid. Any eye trained in monetary matters should immediately recognize the signifgance of this graphic. When first published the article was immediately placed on the home page of Seeking Alpha. Jim Sinclair of JSMineset.com opined, "A very good, simple and clear representation of the problem lacking a practical solution." 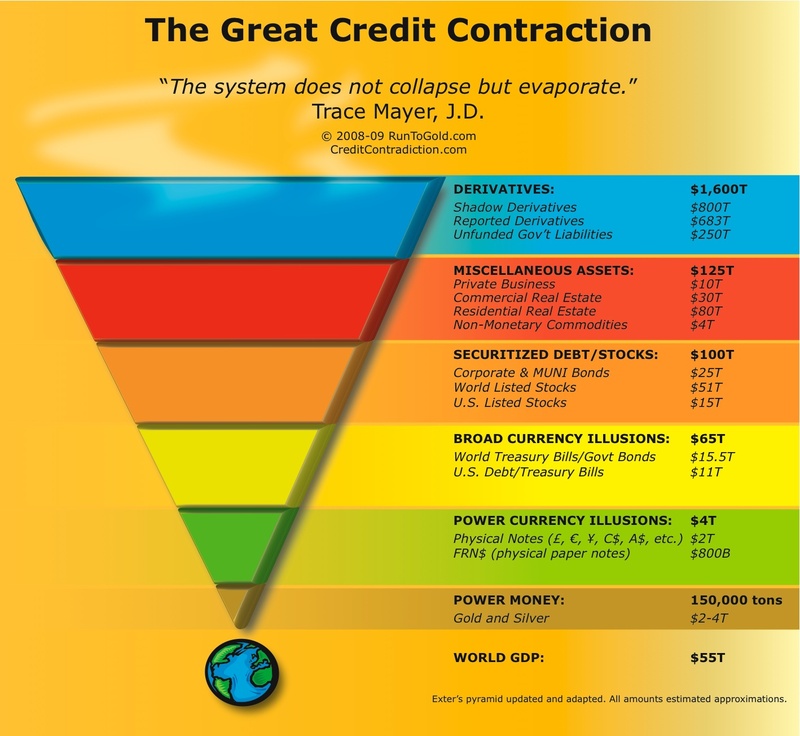 In summary, during The Great Credit Contraction capital, both real and fictitious, burrows down the liquidity pyramid seeking safety and liquidity. The lack of public interest in learning how to buy gold is a prime indicator that this has only begun. I am asserting that gold, silver and other commodities will be used as cash balances before this is over. Both fiat currency and fractional reserve banking pose risks to cash balances which are completely eliminated through monetary evolutions, like GoldMoney, in the Information Age. An example of asset value evaporation from loss of liquidity is Auction-Rate securities or the myriad of assets on the balance sheets of banks. The various bailouts are designed to exchange assets lower in the liquidity pyramid for those higher. Sure, there are currently currency controls on the FRN$ and as it continues evaporating more will likely be implemented. This is why we have seen a decline in the price of homes, stocks and commodities in both FRN$ (illusions) and in gold (money). I have been loquacious enough and I devote chapter 5 to discussing this phenomenon. Mr. North seems mired in definitional chaos and lacking on the ability to clearly, concisely and accurately state the rules. This precludes a coherent analysis and conclusion. When he does attempt to state his factual assertion, such as there is 'no historical evidence -- none -- that gold does well in times of price deflation', it is contradicted by the excellent academic work found in The Golden Constant. Typical of those on weak intellectual ground is his reversion to ad hominem attacks about photography which appeal to emotion and feeling instead of logic and reason. Mish on the other hand seems able to accurately state the rules, analyze the situation and form a conclusion. However, he either seems to not completely understand gold's monetary role or does not think it is currently a material issue. If it is a timing issue, like his critique of Peter Schiff being wrong is a timing issue, then Mish is not wrong but like Schiff has not yet proven right. By analogy Mish is like a shotgun. An adaptable lethal weapon used for short and intermediate range issues. On the other hand, Schiff and myself are more like sniper rifles. While I may disagree with Mish it is likely, as he pointed out once, violent disagreement. I think we are in an epic, perhaps millennial, deflationary credit contraction. Are we on the brink of a 'great dying' in the financial world - one of those mass extinctions of species that have occurred periodically, like the end-Cambrian extinction that killed off 90 per cent of Earth's species, or the Cretaceous-Tertiary catastrophe that wiped out the dinosaurs? I have long asserted that the last layer of the liquidity pyramid to evaporate will likely be the FRN$ illusion because it is the world reserve currency. Along with political currency illusions will likely be the practice of fractional reserve banking. When or how that will happen is impossible to predict because it is based on the human action of billions of individuals. But fiat currency, fractional reserve banking and central banks are barbarous relics of an less sophisticated age. Currently there are functioning alternative digital commodity currencies, like GoldMoney, with extremely slow velocity. But in the Information Age with Twitter, Facebook, etc. they will likely explode on to the scene; perhaps going viral and resulting in the derivative illusion rapidly dissipating. It is not difficult to imagine them completely changing the monetary landscape; like an iceberg that flips. Other barbarous relics like the journalism and music industries likewise undergoing rapid creative destruction. Therefore, the critical question is not whether there will be inflation or deflation. The vital questions for your portfolio is whether and when will there be a currency collapse and how to best prepare yourself. It would be nice if those far-sighted gold bug Cassandras were still all alone but they are now being joined by Establishment Chicken Littles such as Paul Volcker, Peter Peterson and Stephen Roach. Political currency always fails in either a deflationary depression or a hyperinflationary explosion. Ultimately, investors ensconce themselves at the tip of the liquidity pyramid within an invincible and immoveable golden forcefield which is immune to both. Those who fail to move their wealth may see entire fortunes rapidly evaporated. Some already have. Indeed, The Great Credit Contraction has only begun. "I was bred and born in the briar patch, Brer Fox," he called. "Born and bred in the briar patch." Disclosure: Long physical gold and silver, indirect long interest in GIS and no position the problematic GLD or SLV ETFs. There are plenty of ways to spill ink, so if anyone attempts to confront my assertions, it would only be courteous for him or her to use the definitions I propose without deflecting the discussion to a different and possibly tangential irrelevant issue. In the event of rebuttals to my assertions in this book, I will limit my participation to substantive and not semantic arguments.